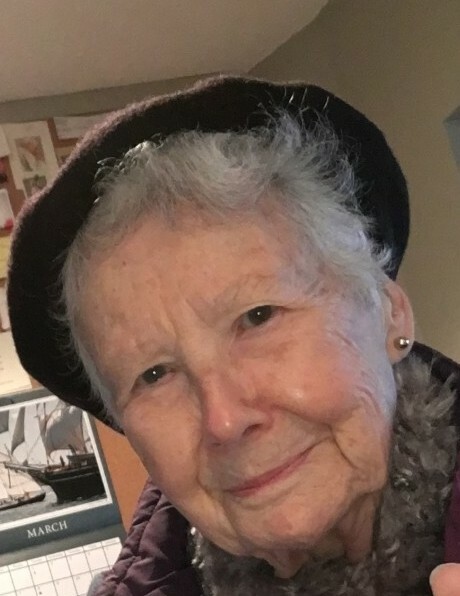 Pierrette Comtois Dumenco, 90, of Tiverton, Rhode Island, died on February 7, 2019 at home with her family at her side after a brief but intense illness. Pierrette was born in Saint-Barthélemy in the province of Quebec in Canada on August 22, 1928 and worked as an administrative associate at the Montreal Botanical Garden before marriage. She and her husband immigrated to the United States and were both naturalized citizens who lived briefly in Brooklyn, New York, and Iowa City, Iowa, before settling down in Milwaukee, Wisconsin. Upon her husband’s death in 1990, Pierrette moved to Tiverton, which became her most beloved home and the place where she founded the Tiverton Senior Center’s Knitting and Quilting Volunteers, a group that creates beautiful quilts, sweaters, scarves, mittens and more to raise money for scholarships for disadvantaged kids. Over twenty-plus years of operation, the group (which is still going strong) has raised upwards of $20,000 and has gone through enough yarn to circle the Earth 26 times (very rough estimate). Calling hours will be held Sunday, February 10, 2019 from 5:00 to 7:00 PM at Connors Funeral Home, 55 West Main Road, Portsmouth, RI. Funeral services will be held on Monday, February 11, 2019 with a Mass of Christian Burial at 10:00 AM at St. Christopher, 1554 Main Road, Tiverton, RI. In lieu of flowers, memorial donations may be made to the Tiverton Senior Center, 207 Canonicus Street, Tiverton, RI 02878 (put “Knitting and Quilting Volunteers” in the memo line of your check).